In slasher movies, it’s not really the killer or the imminent threat of death that’s most frightening. No, the most horrifying element of these movies is that there is no escape route the hero can take to get away from their killer. No matter where you go, a closet, a friend’s house, up the stairs—this single-minded killer will find his prey. It’s kill or be killed. 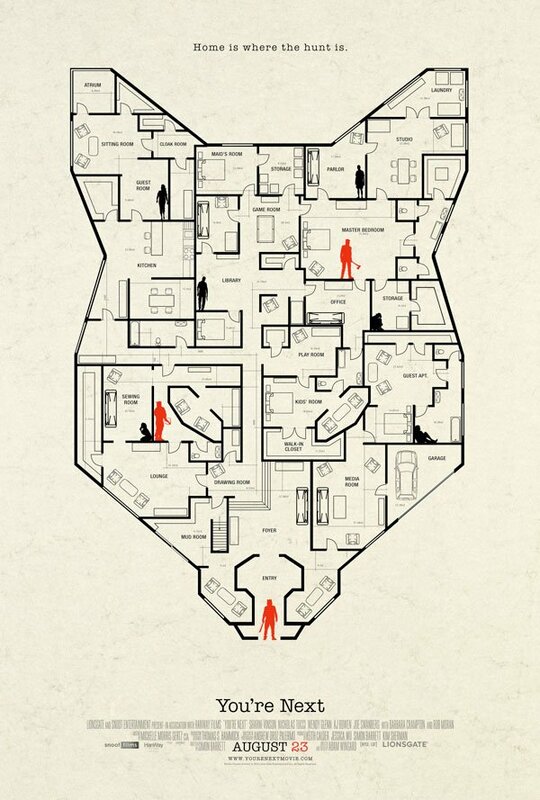 While early posters for the upcoming horror-thriller You’re Next teased its masked killers, the latest, which premiered at Comic Con last weekend, plays up the terrifying idea of “no escape” by presenting a map that resembles the previously revealed murder masks, accented with huddled soon-to-be victims and their eager blood red murderers in its walls. It’s like the game Clue except far more menacing. There’s no escaping the eyes of this wolf. You’re Next centers on the dysfunctional Davison family, who reunites in an isolated vacation house to celebrate a landmark wedding anniversary. But their family festivities and typical squabbles are pushed aside when a gang of merciless masked murderers descend on the house seeking only blood and carnage. Now the Davisons will have to come together to survive this seemingly senseless home invasion. Sharni Vinson, Nicholas Tucci, AJ Bowen, and Joe Swanberg co-star. This marks another collaboration between director Adam Wingard and writer Simon Barrett. Together the pair have proved a prolific force in the horror genre, bringing forth an astounding slate of frightening flicks in just a couple of years. This includes the 2010 stalker/slasher thriller A Horrible Way to Die, as well as three ambitious horror anthologies, V/H/S, V/H/S/2 and ABCs of Death. (All of which are Now Streaming.) But of all these, You’re Next is the one getting the most resounding critical praise. After making its world premiere at the prestigious Toronto International Film Festival in the fall of 2011, You’re Next vanished until earlier this year, when it victoriously returned the film fest circuit, winning praise as it hit San Francisco, Sydney, Los Angeles, and SXSW for a victory lap presentation. The film has an outstanding 91% rating on Rotten Tomatoes right now. And with horror once more at the top of the box office—thanks to James Wan’s spectacularly scary feature The Conjuring--the time seems ripe for You’re Next’s long-awaited theatrical release. Lionsgate will open You’re Next on August 23rd nationwide. But if you have the good luck to be anywhere near Austin, Texas on the 23rd, we recommend you see this horror sensation at Almo Drafthouse’s Fantastic Fest, an event that dedicates itself whole-heartedly to genre cinema.